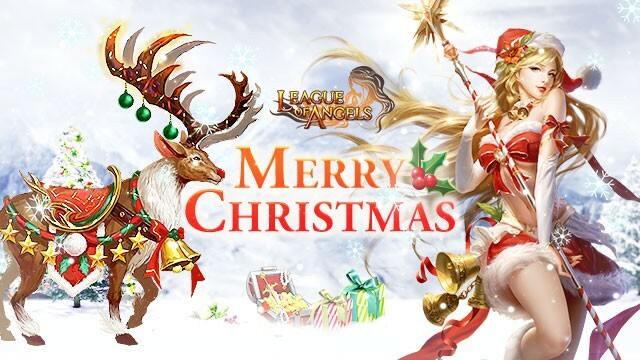 League of Angels New Update: That's the Way Christmas Season Starts! Christmas is approaching! League of Angels is excited to bring something amazing to cheer you up during the holiday season! New angels, mounts, Christmas decorations… we have them all covered. Don’t miss out on all the great additons! The Goddess of Winter has arrived in League of Angels, which can partly explain why snow, ice and Christmas often go together. With Glistening Glacier, she deals 160% Basic ATK magic damage to all enemies, and increases all party’s DEF, ATK and hit by 7% with a 100% chance of hitting. Everyone loves Rudolph the Red Nosed Reindeer. This year in League of Angels we’ve got him an evolution, Frost Reindeer. His exclusive Frosty Heart will increase ATK for all the party members. A gorgeous mount to fight alongside during the holiday season, isn’t it? Add some holiday fun to the bells, and they are even more festive. Have you ever thought of ringing the Jingle Bell to summon a mysterious power? Try it now! When it comes to special occasions, there’s no reason to resist a set of cool equipment. Players will get the unmatched equipment by completing certain tasks in front of a Christmas tree during the holiday season. >New Homestead: Christmas the Style! Build your very own Christmas Homestead and relax after a fierce battle against evils! All kinds of Christmas-themed components are at your disposal! In addition, there are free giveaways from time to time both in game and our Facebook. We wish all players a Merry Christmas!